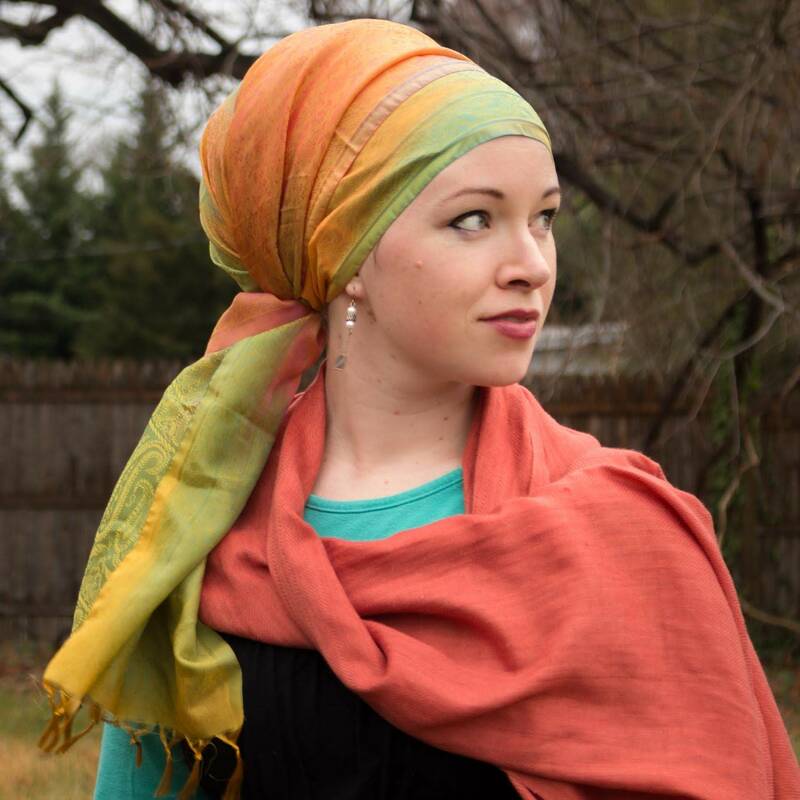 A magical rainbow of watercolor-like hues spills across each of these fantastic scarves! Because of the way these are made, each Signature Silk Scarf is one-of-a-kind. We have divided them up into color categories to help you decide. When you receive your scarf, open it up and be wow-ed by the colors spilling out! Every time you wear it, depending on how it’s positioned, it will look different! Please note: these tichels are delicate! They are not recommended for beginner wrappers as a full head covering because they are silky and therefore a little more slippery than most standard Wrapunzel tichels. However, they can be worn by any beginner as an easy sash and later as a full-coverage wrap when you get more confident! If you’ve been wrapping for a while, then don’t be scared, they are not difficult to wrap – we would never stock anything at Wrapunzel that isn’t just magical for wrapping! I love these signature silk scarves! I’ve never had much luck with wrapping a silk scarf but these don’t give me any trouble! The colors are so delicious that I got 3 different colors! The one pictured is the pastel. It actually pleats very easily on its own. I will be getting more of these soon! First off, I placed an order at midday Thursday; it was in my mailbox Saturday morning. Woohoo! So this was in my head an hour later. The colors are spectacular; it’s a wash of one color blending into the next, with a lovely kind of jacquard pattern. The silk is crisp but lightweight, more satiny in texture. I can tell that this will snag if not treated judiciously (so one must be very careful with the Velcro closures on underlayers). It folds, drapes, and tucks beautifully, but is a mite slippery, as expected. I love, love, love the fringe and the edge patterns. I see sign that it may fray, so will be using some fray-check on it tonight. The color group I chose was “Desert Flower”, and it was totally the right choice. I’ve attached a photo with the scarf slightly oddly draped to show the colors (why, yes, it coordinates with my daybed…). I think this one will need a bit of tender care, but I’m rating it highly already, because it’s so, so lovely. I’m absolutely in love with these. The colors are stunning and the light weight makes them a blessing in hot weather! The slight slipperiness takes a little getting used to but they’re gorgeous enough to make practicing a delight! I have two of these tichel’s. One is bright and one in pastel. I love the colors and the texture. But, they are very difficult to wrap with. The silk slips and slides. I have good days with them and bad days. The only other complaint I have is that they are very delicate. The slightest rough spot on my hand or fingernail and the silk will snag. But, they are GORGEOUS! This is my favorite scarf. I love how soft and versatile this scarf is and how many outfits it can compliment. If you are looking for a scarf to start your wrapping journey, try this one…you will not be sorry. I love this tichel! I was nervous at first that it would be difficult because it is silky, but it wraps really well. I have a teal 2 in 1 as a base with the dark. I always get a lot of compliments when I wear it! 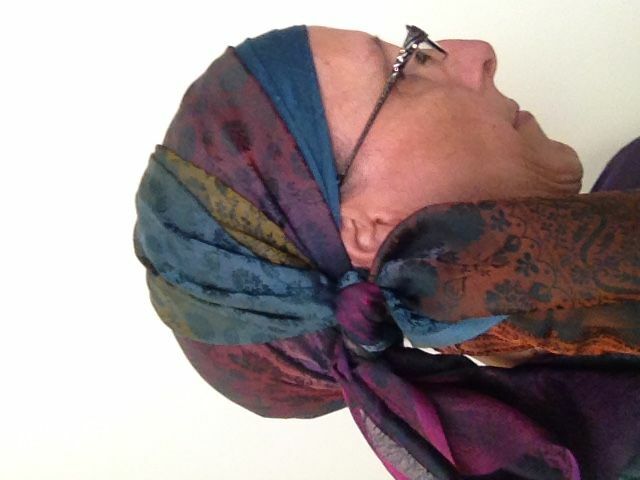 Although I have tried before in a previous review, no words can do justice to this scarf. 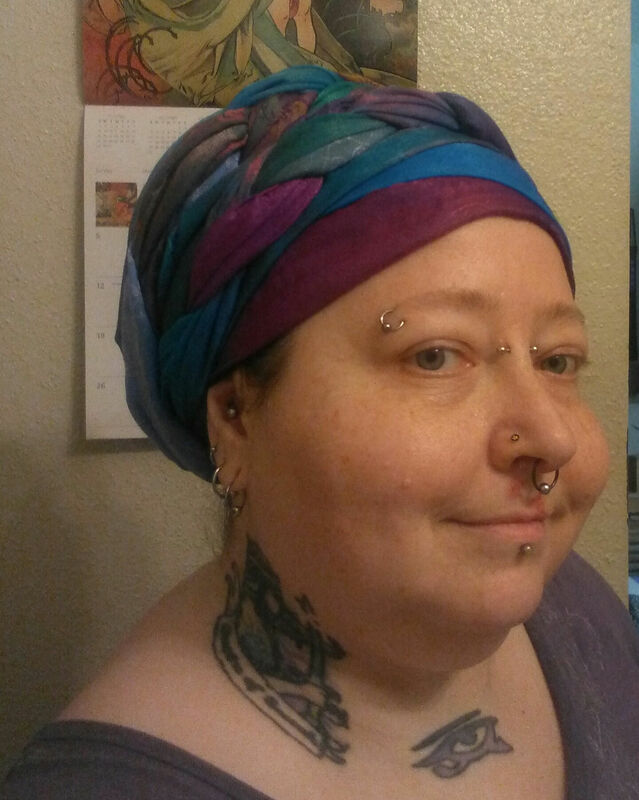 It is beautiful on its own, but I also wear it paired with other scarves as well. This is one of the more special scarves that Wrapunzel has to offer, and there are so many options. Always beautiful, it will give a great look. The silk is sooo beautiful! The pattern makes the sheen show more and the colors are lovely. The scarf is so narrow that you might not need to fold the side at all. My silk is in the photos is the pastels one. I just got this today in royal, and oh WOW! Mine is a deep purplish-red with stunning shades of blue and fiery yellow shimmering in the light, and a delicate flower pattern woven into the silk. I have two of these, and they are pretty special. Surprisingly since they are silk, they are not too slippery, although they can be tricky to place neatly on your head. The colours are beautifully blended, and there are many options in how to place, fold and twist each scarf to give you a different look. (I have even used the edge as a decorative “border” just like some of the fancier pashminas in the store.) Pleating the scarf also shows off a lot of great potential. I have worn this in every day situations, and also for formal occasions, both alone and paired with another scarf such as a 2 in 1 or a shimmery. I have even enhanced it with another silk scarf as a sash. 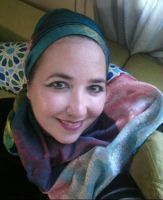 (A different silk scarf, not the signature.) There are a lot of options to this scarf. Surprisingly, I find that I haven’t worn this very much. It could be that once the weather turned colder, I forgot about this, but every time I put it on, I am reminded how special it is. I love the richness of the colors. Nothing dyes quite like silk. I may have to buy another, because I am not always the most gentle with my scarves and it is fragile, but for such a good price, why not? As a beginner I was a little bit intimidated by this Tichel, but it looked so gorgeous I had to order. I figured I could use it as a sash and work my way up as a became more familiar. It was actually way easier to work with than I thought, of course I used my “Wrapunzel Signature Shaper” to help it from not slipping and tried my newly mastered “Easiest long scarf wrap” and it was beautiful! I was definitely wowed by the colors! I choose the Royal one and the colors are just that. They almost seem to dance in the light! Mine has the colors stripped following the long edge of the scarf which I couldn’t tell from the photos so I’m not sure if they are all like that, but each block has a two-toned effect adding to the wow factor. I have this scarf in royal in shades of blue and purple. It’s simply gorgeous. It is somewhat slippery. 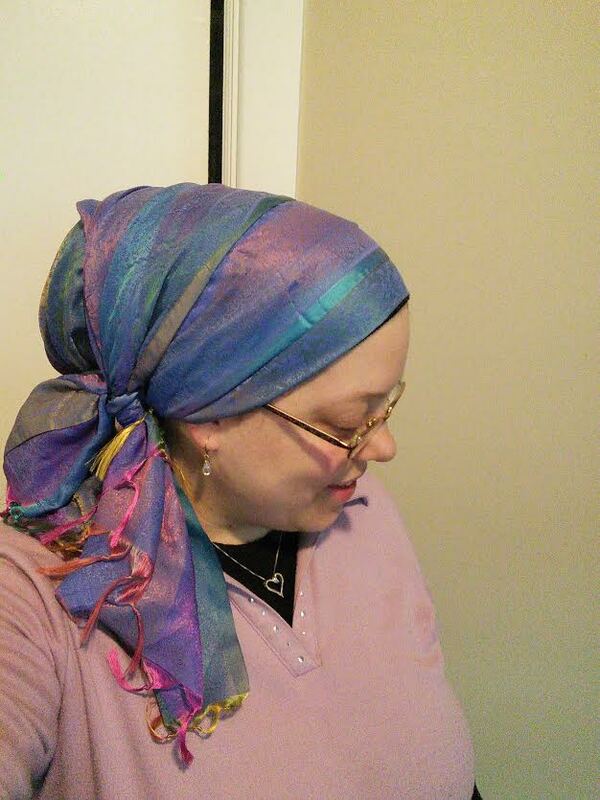 I have covered my hair for many years now, but I still have to take a little time to tie this one right. Still, it only takes me a couple minutes to tie it right, so it’s not so slippery that it’s frustrating. It’s a perfect size and very lightweight with gorgeous colors. 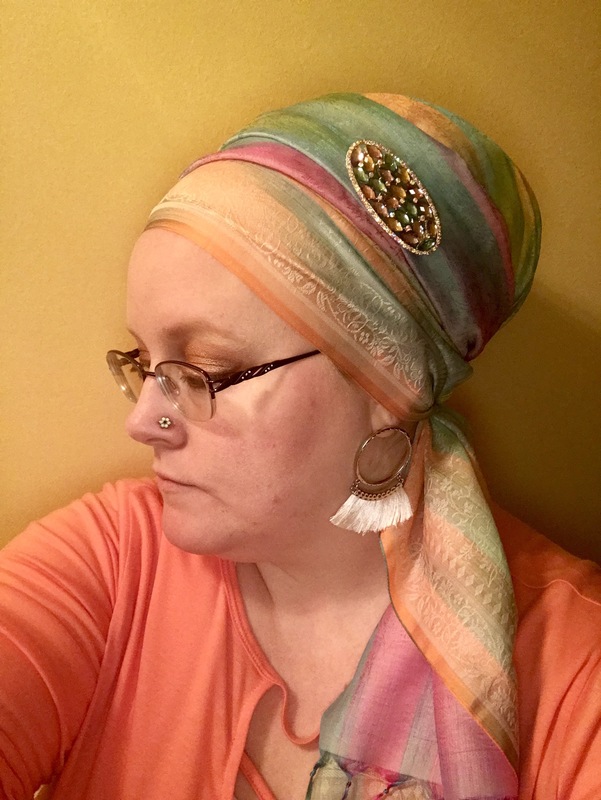 I generally wear it in a basic wrap with short tails because I like to show more of its length and colors but don’t want the tails hanging down far enough to get pulled by my bag. It is very delicate. Mine was starting to fray slightly at the edge on the first day I wore it (with longer tails, which is why I now keep my tails on this scarf short), but I painted some clear nail polish on the ends to stop the fraying. That seems to have worked. I remember when I first saw this and I just had to have one. Mine is dark and it reminds me of the blend of colors in oil paintings. 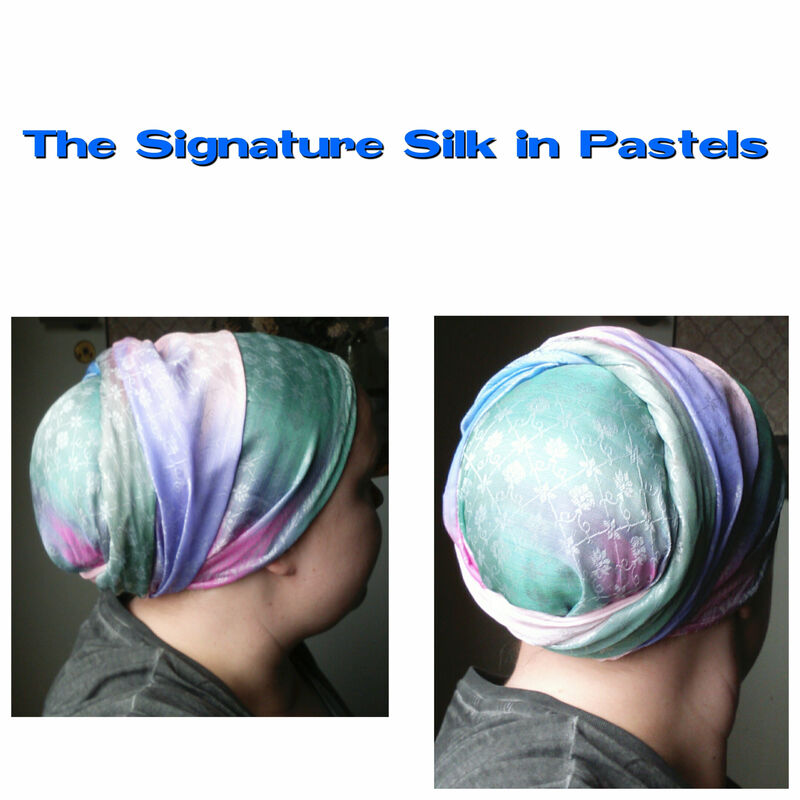 It seemed a bit short, but I love wrapping it in a turban or in a turban regal wrap with twist or a basic round wrap. 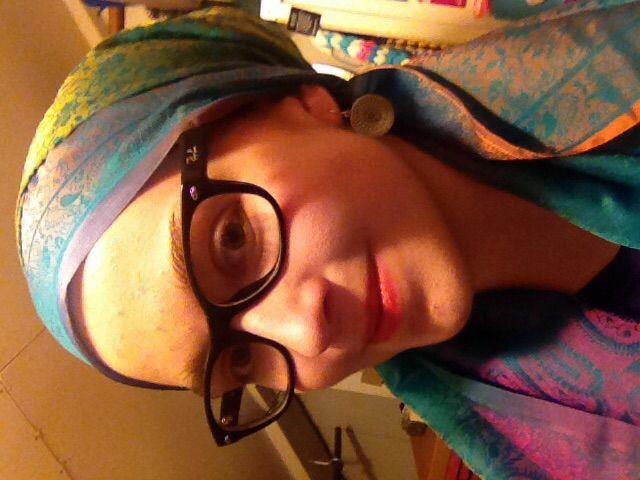 Because it’s so dramatic, I love wearing it on Shabbat all by itself. Here is the tichel I learned on – the first I ever used. It is gorgeous and perfectly sized. Just the right thickness and did I mention gorgeous?